This is the final report of the 2016 crop year, covering the conditions and observations made between Monday, October 3, and Sunday, October 23, 2016. The next report will be posted on or about Monday, January 30, 2017 prior to the start of the 2017 bloom. 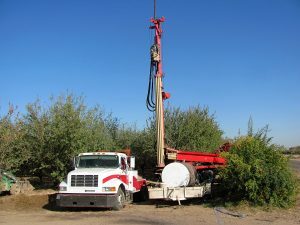 Our photos for this final report of the year present just a few of the normal post-harvest tasks being conducted throughout the region; a sprayer applying foliar nutrients in Tulare County, followed by a gypsum application and maintenance on a well in Madera County. Mild to warm conditions dominated the southern region’s weather during October, providing ample opportunities for completion of the 2016 harvest. Daily maximum temperatures ranged between the lower 70’s and lower 90’s, with warmest readings reported at the end of the period’s first week. Meanwhile, morning low temperatures dipped into the mid 40’s to lower 50’s throughout the month. Rainfall threatened to dampen the final days of harvest as a fairly potent early-season weather system approached at mid-month. While the system brought the hope of rainfall, promises were broken and only a few hundredths of an inch of rain was reported in the isolated area of the region. 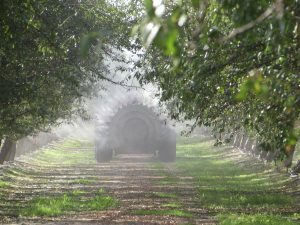 While a few, isolated orchards remain to be picked up, we can now pronounce that harvest operations have been completed in the southern region. This year’s harvest was one of the smoothest, trouble-free seasons in memory. Growers have moved on to post-harvest operations, first of all completing critical irrigations needed to replenish the soil profile. 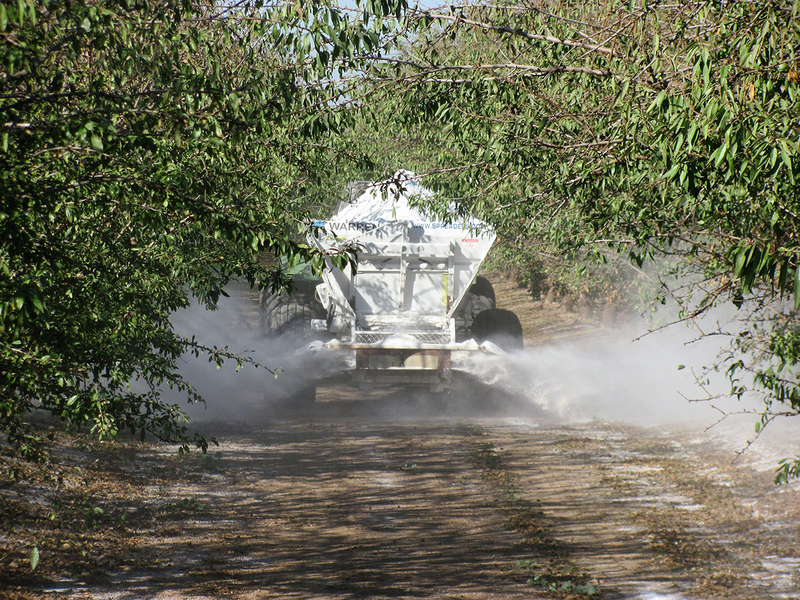 Observers have reported that a large number of orchards are receiving applications of gypsum, calcium sulfate, needed to “open” the soil, providing a means to exchanged sodium accumulations, improving water penetration and overall tree health. Fertilizer applications are also being conducted; potassium and compost via soil applications and zinc sulfate through foliar treatments. Crews can be found pruning trees and shredders have already moved into the region to grind the resulting brush. As shown in the accompanying photo, crews can also be found performing maintenance on the region’s many wells. All in the region are hopeful that this winter will bring ample rainfall. Rain is needed for many reasons. Replenish reservoirs, cleanse the soil, and provide for easier removal of nuts that failed to shake from the trees during the harvest are just but a few. As growers work to complete required tasks, huller/sheller operators are working to complete processing previously harvested product. While most will be finishing their season in the next few weeks, larger operations with the greatest amount of stockpiled crop expect to finish the last loads of the year by the end of November.